A huge fire has swept a school in Surrey, south of London, following reports of an explosion, with around 40 firefighters at the scene tackling the blaze. Ambulances and a helicopter are at the scene. Police confirmed that all individuals had been accounted for. 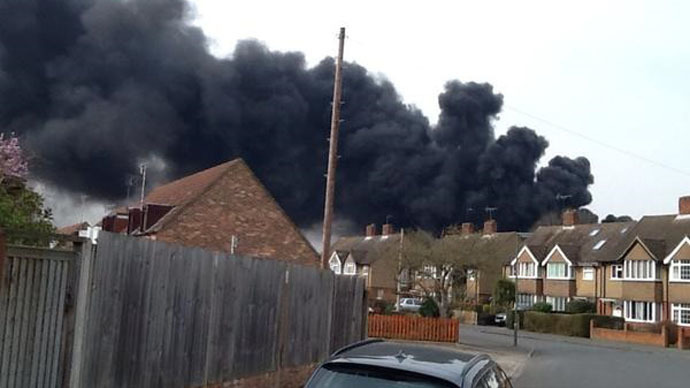 Get Surrey reported the clouds of black smoke could be seen throughout Weybridge. Chris Marchington told the paper he was in his back garden with his son when he heard the explosion. “It was the beginning of a smallish fire at that point, on the roof of the new build that's happening at St George's School,” he said. Marchington reported that small flecks of ash and charcoal were drifting down over streets near the school. “There was a small explosion, big enough for us to hear and there were flames on the roof of the new building,”he said. “Things then just escalated really quickly,” he said.